Forget dessert wines ... now you can get yourself a deliciously smooth alcoholic ice cream treat to start the summer of 2017 off on your path to sheer bliss! Another fantastic foodie's paradise has opened in New York City, and it's called Tipsy Scoop Parlour. You can thank the adorable shop's owner and creator, Melissa Tavss, for making this a summer you'll be sure to remember. According to an article in Cosmopolitan, Melissa first began experimenting with the idea of liquor-infused ice cream when she'd return home from her job as a publicist for liquor brands. After picking the perfect recipe and concept, she started Tipsy Scoop as a catering company in 2014, working in a location in East Harlem, New York. Due to its growing fan base and enormous popularity, Melissa soon decided to find a permanent home base for her alcoholic treats. "People were coming all the way [to East Harlem] to try [Tipsy Scoop]," she said in the Cosmo interview. "We were in hairnets making ice cream, so that's when we realized we needed a store." 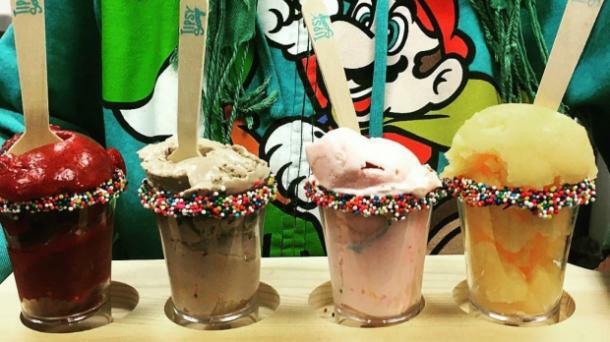 This ice cream shop serves various flavors of ice cream, gelato, and sorbets. But unlike regular shops, these tasty treats are infused with just below 5% alcohol. So while you won't get drunk, you can definitely get a happy buzz going on a hot summer night. These delicious-looking desserts may not bring you anywhere near closer to the summer body you may be hoping arrives in time for hitting the beach and streets in your bikinis and short-shorts (or even your romphims, if that's your thing), but hey, let's be honest. There's so much more to life than perfect abs, and most of us never get there and probably only stress ourselves out trying to get them anyway. If you don't happen to live in New York City, there IS hope for you yet! Tipsy Scoop will be carried by grocery stores in various locations throughout the U.S. — AND they will even ship the ice cream directly to your home!